Safe Ports along with Al Hamed focus on the greater issues within trade topics, focusing on free trade zones and logistics hubs that support successful movements of cargo in all sectors from sea to rail and highways. His extensive line of experience will prove successful for Safe Ports and the 2019 business initiatives. Safe Ports announcing the transition is just one of the various ways industry leading companies are gearing up for 2019. Safe Ports is a company that fully embraces the logistics opportunities before us." Safe Ports Holdings, a woman-led logistics and inland ports-focused company, announced the appointment of His Highness Sheikh Khalid Al Hamed to lead operations and efforts to support the company’s overall vision to establish world-class logistics hubs, specifically in the African and Middle Eastern region, according to a release this week from the company. “Safe Ports’ is establishing technologically advanced logistics solutions which can accelerate economic prosperity throughout this region. Safe Ports is a company that fully embraces the logistics opportunities before us, and is making a difference, we are very pleased to be a part of this effort,” His Highness Sheikh Khalid Al Hamed said. His Highness Shekh Al Hamed holds several esteemed positions as the KMK Investments Executive Chairman along with his various real estate, construction, and other business investments. This extensive line of experience will prove successful for Safe Ports and the 2019 business initiatives as Al Hamed takes the new position on the International Advisory Board. Safe Ports along with Al Hamed focus on the greater issues within trade topics, focusing on free trade zones and logistics hubs that support successful movements of cargo in all sectors from sea to rail and highways. 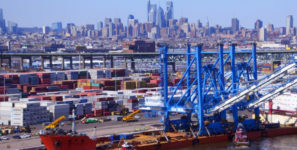 Safe Ports announcing the transition is just one of the various ways industry leading companies are gearing up for the upcoming new year, proving planning efforts are to be implemented sooner than later.